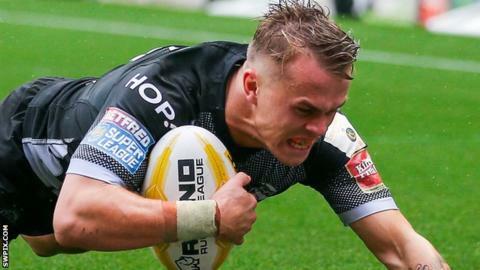 Catalans Dragons have re-signed outside back Lewis Tierney on a two-year contract, following his departure from Wigan Warriors. Tierney, 22, spent the final three months of the season on loan to the Dragons from Wigan where he scored three tries in 10 league games. Before joining Catalans he scored 18 tries in 37 games and made his Scotland debut in the 2016 Four Nations. "Lewis proved to be a tremendous signing," coach Steve McNamara said. "His commitment, desire and determination to help us maintain our Super League status was there for all to see."